Pours a nice pale copper with a very rich looking white head. Very nice nose, light caramel malts with a very pleasant flowering hop aroma. This is a nice representation of an English IPA. Lightly sweet caramel malts up front a nice combination over the tongue and then a light hop bitterness and more light malts on the back end and finish. I’m not a big fan of American IPA’s but this English IPA is pretty good. There is good deal of hop bitterness but it is balanced with caramel malts better then most of the American versions are. This is a nice refreshing ale with a good amount of a bite, or hop bitterness. It is a very hoppy brew but the hops do not overpower the beer. The head has diminished to just a patchy island and a ring around the glass. It is also leaving some pretty nice lacing. Now at 67 degrees the beer is a little smoother or maybe I’m getting use to the hop bitterness. All and all this is a very nice beer. I think I’ll have another one as I work on my final thoughts. The second beer is even more enjoyable. 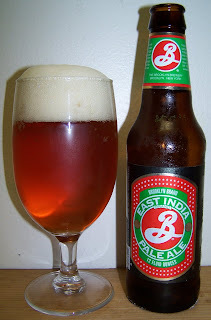 I usually find that Brooklyn’s beers are very faithful to the style. My general rule of thumb is that if you don’t like one of Brooklyn’s beers then you most likely don’t like that style of beer. I like this beer, it’s a nice drinkable IPA and the English IPA is more palatable for me. I’ve had several English Bitters before but I’m not sure about an authentic English made IPA. Assuming this is true to that form I’ll have to look into more English IPA’s; they may be a nice summer alternative for me. Well, IPA’s are not my thing so rating this beer is a little difficult. Just based on how much I like it is about a B or a B+ but I really don’t know enough about the style to rate this to the English IPA style.